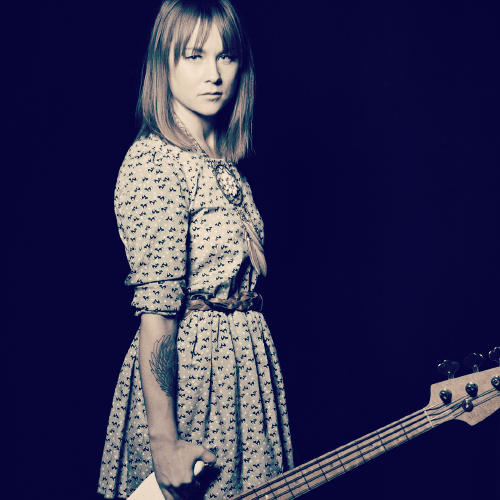 Estonian bass player Mai Leisz’s story is extraordinary. On moving to Sweden to study music in 2010, she started her own band, MaiGroup, writing and recording two albums Luv (2013) and You (2015) as well as touring nationally and in Estonia.In 2014, Mai was hired as bass player for Linnea Henriksson, who has enjoyed major hits in Sweden. This introduced her to a wider audience. Her next move was to connect with the Nashville street music artist Doug Seegers, who had become well-known in Sweden through a TV show on which his music appeared. Mai became Doug’s bass player in 2016. An interesting chain of events led to unexpected territory. Mai and Doug, who sometimes played in the streets of downtown Stockholm, were performing an outdoor set when one of Mai’s all-time favourite musicians, Greg Leisz—who was in town to play with Jackson Browne—walked past. Greg was on his way to meet up for lunch with the legendary bass player Bob Glaub—who has played on countless recordings with Ringo Starr, Rod Stewart, Journey, The Beach Boys and many other bands—and mentioned to Bob that he should check out the couple on his way back.As Bob walked up to Mai and Doug, they were packing their stuff away. He mentioned that he was in town to play with Jackson Browne and invited them to dinner with the band. Later that day, while they were watching the soundcheck, Jackson himself suggested that they should join his band for a couple of songs at the gig.One thing led to another—and before long Mai found herself in Los Angeles, being introduced to David Crosby, who invited her to play and write for his forthcoming album. Once she was on board as David’s bass player, EBS came into the picture and helped her out with equipment for her first tour with him, in the spring of 2017. You can hear Mai play on David Crosby’s new album Sky Trails (2017) and see her on tour with David Crosby Band.